Today I did a slightly longer tour for here. 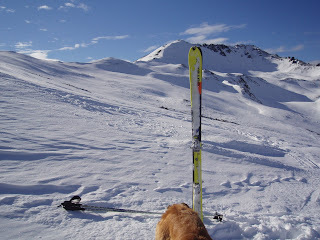 I decided to tour from cheeseman along the Cragieburns to Mt Olympus, which looks into another ski area. 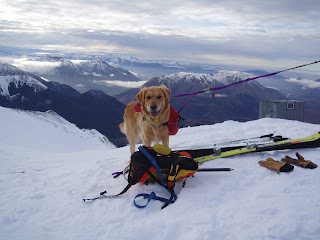 For company I had Tussock who wore his backpack containing rope and water. Conditions were pretty stable, and I checked in with the patroller at Cheeseman before leaving. The return trip as about 11km with approximately 1500m ascent once you count laps done. I had some good runs into the Ryton valley and also on the way back into Tarn basin. Unfortunately I didn't take enough food and I got rather tired on the way home -( low blood sugar levels, making me feel slow and a bit dizzy) point to remember for next time!And I'm glad I wasn't too far out in the back country. Conditions were good although I stayed away from cornices, as there had been some activity on the lee SE side. Generally the skiing was better on the SE, and much of the NW was iced up. 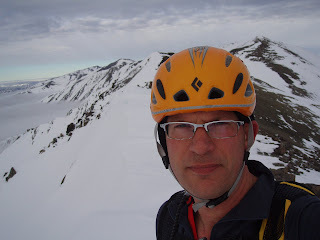 I needed crampons and ice axe a couple of times at higher points - Summiting Cheeseman(2031m) and then again Olympus (2094m). All gear went well. It was frustrating at times as the snow conditions fluctuated between beautiful powder, wind accumulated drifts and bare ice. So skis kept having to come on and off, as did crampons, and some of it I just boot packed.I'm sure it could be done a lot faster than 5.5hours. On the return trip it snowed a little, but generally visibility was good.The photos are me, Tussock at the top of the tows at Cheeseman, and terran at the top of the Ryton wich was great.